The Bangor property with the greatest number of code violations in the last 28 years was 74 Court St., just up the road from the Penobscot County Sheriff's Office. City inspectors found 43 sets of violations there over the years, 38 of them before Paul Cook and his business partner, Jesse McCue, purchased the 12-unit property in 2012. In one apartment building on Center Street in 2013, a leak in the hallway was freezing, creating a large patch of ice. People were stepping on it and falling. At an apartment building on Jefferson Street in 2015, both gas lines and the roof were leaking. In 2014, a tenant on Essex Street hadn’t had a flushable toilet for 90 days. In one home on Fourth Street in 1999, about 70 bees had taken up residence in a child’s room. The stove wasn’t working. Part of the ceiling had fallen in, and the phone jacks didn’t work. From sewage in the basement, to a house visibly shifting on a poor foundation, to stains on a rug from a dead person’s body fluids, Bangor’s code enforcement office has seen a wide range of health and safety issues in people’s homes. But what makes these code violations different is that they were discovered at rental properties where the current landlords benefit from public funding to cover their tenants’ rent. Most of the city’s General Assistance goes to housing — about $1.4 million out of $2.1 million last year, with the remainder covering other basic needs such as food, heating and medicine. The emergency aid funded with state and city dollars is often the only thing preventing people from becoming homeless. But much of it is paying for poor-quality housing, even as all other rent subsidy programs require homes to meet quality standards. Since 1990, there have been about 804 code violations at properties owned by the people and companies who are collecting, in some cases, tens of thousands of dollars in General Assistance from the city each year for their tenants’ rent. 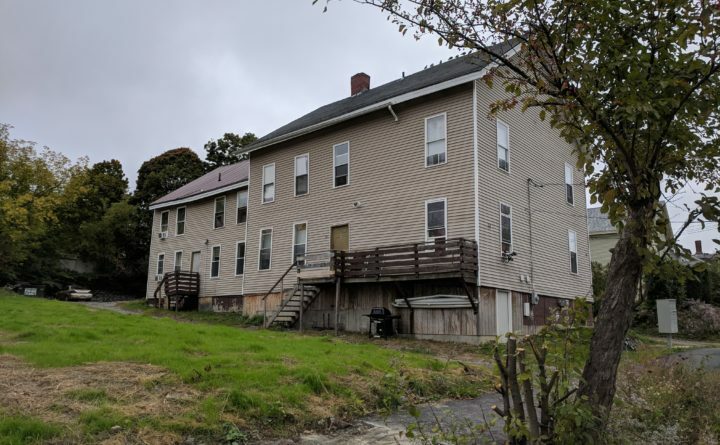 To reach that total, the Bangor Daily News first determined the top 23 landlord recipients of General Assistance in fiscal years 2017 and 2018, who collected $1.3 million over those two years. It then used assessment records to create a list of 124 of their properties in Bangor. With those addresses, the BDN then looked through paper files at the code enforcement office to determine the number and nature of violations at each property over the years. It’s not possible to tabulate the number of code violations at specific apartments subsidized by General Assistance because the names of tenants receiving the aid, and thus the addresses of the apartments they are renting, are confidential. The names of the landlords or owners whose tenants get General Assistance, however, are public. And it’s clear they have some substandard housing. It’s not possible to compare the 124 properties with others without going through hundreds or thousands of files by hand. So it’s not currently known whether landlords receiving General Assistance have more code violations than those who don’t receive the aid. Beyond the numbers, Rindy Fogler, the city’s General Assistance administrator, has heard concerning anecdotes from General Assistance recipients who have to check in with the city’s community services office every month. In one case a person was living in an attic accessible only by a drop-down ladder in someone else’s second-floor apartment. Others have told her about bed bug problems, or water coming through the ceiling when their upstairs neighbor took a shower. Fogler surveyed 85 aid recipients this summer. A fifth of them said they felt unsafe in their apartments. A fifth said they felt unsafe in their neighborhoods. And a fifth rated the quality of their housing a “1” or “2” for poor condition on a five-point scale. How long does it take for landlords to fix the problems? “Sometimes never. Sometimes days. But days is a lot if you don’t have plumbing or it’s raining in your living room,” Fogler said. As a city work group contemplates what to do about Bangor’s housing challenges, one option is for Bangor to follow in the footsteps of Maine’s two largest cities and require inspections of apartments that it’s subsidizing. Those inspections started about two decades ago in Portland, with staff from the city’s Health and Human Services Department examining apartments. Today, the apartments supported by General Assistance are part of the city’s larger inspection program that requires all landlords to register their rental units. Code officers from the city’s Housing Safety Office now inspect all registered rentals on a rolling basis. If an apartment with a tenant who relies on General Assistance for rent fails the inspection, Portland withholds the aid payments until the landlord corrects the problems, said Aaron Geyer, a senior human services counselor with the city. The city’s inspections director, Jonathan Rioux, said common violations include blocked emergency exits, illegal apartments, missing or broken electrical outlet covers, leaky faucets, missing or non-working smoke and carbon monoxide detectors, and insect infestations. Lewiston instituted an inspection requirement for General Assistance-funded rentals earlier this month. The city plans to inspect apartments within five days of new tenants moving in, the Sun Journal reported. Requiring inspections in Bangor could prompt more landlords to get their properties up to code. But an inspection requirement for General Assistance units could also bring unintended consequences, some said, including a reduction in the amount of housing available to some of the city’s poorest residents — many of whom have substance use disorders, mental health challenges and physical health problems — and delayed move-ins for tenants whose options are poor-quality housing or none at all. “A lot of landlords will say, ‘You know what, I’m just done with this,’” said Heidi Bradley, rental assistance coordinator for the Bridging Rental Assistance Program, a state-funded rental subsidy program for adults with mental illness run in the Bangor area by Community Health and Counseling Services. Fogler acknowledged this possibility. But, she noted, landlords whose units don’t pass a General Assistance inspection would, in some cases, miss out on tens of thousands of dollars in potential rent each year. “If that comes off your bottom line, I would think you’d have to do something about it,” she said. Out of a handful of publicly funded rental assistance programs in the Bangor region, General Assistance is the only one that doesn’t require inspections of the apartments it’s subsidizing. Some 399 households in the Bangor area are renting apartments with the help of federally funded Section 8 vouchers. The federally funded Shelter Plus Care program — which moves homeless people with mental health or other challenges into housing and then provides them with additional services — helps out with another 330 households in the region. And the state-funded Bridging Rental Assistance Program for adults with mental illness pays part of the rent for another 190 rental units. Through inspections, those programs are supposed to ensure subsidized apartments meet housing quality standards set by the U.S. Department of Housing and Urban Development before the money starts flowing. They also require follow-up inspections. General Assistance paid at least part of the rent for 535 apartments in Bangor at some point during the last fiscal year, according to Fogler. Rent is by far the largest expense for General Assistance, whose costs are covered 70 percent by state taxpayers and 30 percent by the city. In Fogler’s survey of General Assistance recipients, about half said their apartments had been subject to some sort of inspection by someone other than the landlord, likely because of General Assistance’s overlap with other rental subsidy programs. In addition, Bangor firefighters started inspecting apartments in three- and four-unit rental properties in 2015, looking for fire hazards and other life safety threats. But with no consistent quality threshold for General Assistance-funded units, the city is footing the bill for some poor-quality housing, said John Karnes, president of R&K Property Management, which owns and manages rental units throughout the Bangor area, including units that tenants rent with the help of General Assistance and Section 8 vouchers. General Assistance is the only public money landlords can collect when their units wouldn’t pass other programs’ inspections, he said. To be sure, the current owners of the 124 properties reviewed by the BDN aren’t responsible for all the violations since most of the properties have changed hands since 1990 — often multiple times. And tenants caused a number of the violations, including trash complaints, smoke detectors ripped from walls and unsanitary apartments. The property with the largest number of violations in those 28 years was 74 Court St., just up the road from the Penobscot County Sheriff’s Office. City inspectors found 43 sets of violations there over the years — 38 of them before Paul Cook and his business partner, Jesse McCue, purchased the 12-unit property in 2012. In the last fiscal year, Cook and McCue’s companies were the largest recipients of General Assistance in the city, taking in $64,395 to house low-income tenants at the Ranger Inn on Outer Hammond Street and five other rental properties in the city including 74 Court St.
Cook said his business has invested money in shoring up the foundation and the building’s structure, and upgrading electrical work. “With that alone, we’re giving people a better place to live than what it was prior,” he said. Still, landlords and property managers don’t have full control over what happens at their properties. This past summer, property records show Bangor’s code enforcement office condemned one of the property’s 12 units, deeming it unfit for human habitation because of the amount of rubbish that had accumulated in the apartment. The tenant had to quickly move out. In that apartment, Cook said, the tenant often turned the stove on and fell asleep, which filled the entire building with smoke and put other tenants at risk. She had also unplugged her smoke detector and didn’t clean up her unit when asked. “We give everybody an empty unit that’s been cleaned and is safe, but what it might look like six months from now” is unknown and up to the tenant, Cook said. Accepting General Assistance for rent already requires landlords to make trade-offs. Adding an inspection requirement would be one too many, said Matthew Willette, whose two rental properties in Bangor house tenants who rely on General Assistance. Willette received $27,133 from Bangor’s General Assistance program in the last fiscal year, which ran July 1, 2017, to June 30, 2018, according to city records. That placed him 10th on a list of more than 200 Bangor landlords who accepted General Assistance as rent at some point during the year. That’s because recipients have to request the assistance anew each month, so they face the prospect of losing their source of rent monthly. Over the past five years, more than three-quarters of Bangor’s General Assistance recipients have received help for less than six months. By contrast, tenants with Section 8 vouchers, which they can use at apartments that pass inspections and fall within specified price ranges, recertify that they’re eligible for their vouchers annually. In addition, General Assistance doesn’t pay a security deposit. An inspection requirement, Willette said, would add to the financial risk because of the expense of making improvements required by city inspectors and the time involved with the whole process. Plus, he said, the city could spend its money on something besides apartment inspections. But without the basic quality threshold of an inspection requirement, and with no prospect of collecting more money for a higher-quality rental unit, the General Assistance program offers no incentive for landlords to fix up their properties, said Karnes, who collected $4,228 from General Assistance in the last fiscal year. The same goes for the publicly funded housing programs that do require inspections, he said, since the inspections are basic, and they’re pass-fail. For the landlord, upgrades that go beyond the basic quality standards would eat into what could already be a slim profit margin, and they don’t allow the landlord to collect more money from Section 8 or another voucher program. “Why would you ever paint it, why would you ever put new flooring, why would you ever put new cabinetry in, if you’re never going to flunk it?” he said.